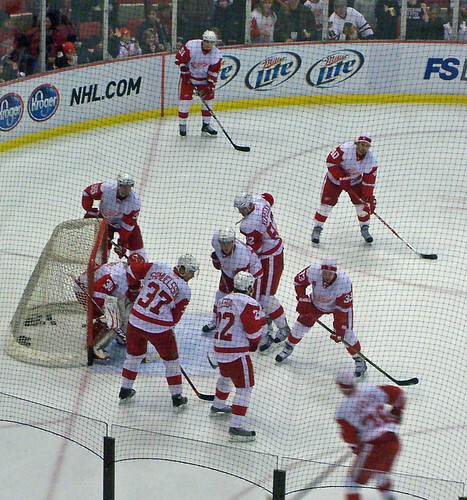 The Red Wings usually have the traditional New Year’s Eve game. It has happened as long as I can remember. I started going to Cheli’s Chili shortly after it opened downtown after working the game. It was a fun tradition but since the NHL is trying to create a new tradition sometimes we have to adapt to change. We will see the Red Wings play the BlackHawks at Wrigley Field instead on January 1, 2009. This Winter Classic II is an outdoor game that started a few years back and the idea is a great one. The idea of playing a sport outdoors for thousands of people where the game originated is appreciated. Though, the NYE game will be missing this year, this new tradition and being able to share this with the entire region is something special. The first Winter Classic was played between the Buffalo Sabers and the Pittsburgh Penguins on a snowy day on Jan 1, 2008 at Ralph Wilson Stadium in Orchard Park. It was blizzard conditions and there was some ice problems but it was still worth having the game. This was the first game on USA soil the Heritage Classic on November 22, 2003 and was between the Edmonton Oilers and the Montreal Canadians at CommonWealth Stadium. Wings get ready to take on the Hawks for a PRE Winter Classic collision! Nothing in life is ever constant. You can not go through life with one complete tradition. Life events usually change things for people. My Mom passed away July 3, 2007 and that first Christmas with her gone was a rough one. My Dad, Aunt, and I went to the Bone Yard for Christmas. I picture the holidays as a day spent with friends and family not spent at a restaurant. This year I am cooking dinner. My house has never held a party, and I have never thrown one. So this should be interesting. I feel traditions can change but sometimes you have to keep the spirit of the family and the home cooked part of the holiday. That is the best part of the holiday and when you lose that part. Every tradition can be tweaked and changed for a year or so but as long as things can go back to somewhat the way they were for a day it is great to keep the spirit. As we get older, it is less about what we receive but what we can give to one another, these hard times that we are experiencing should be a lesson that our family and friends should be appreciated and not taken for granted. So keep the tradition’s alive and remember that things can change for a year but you can you can also create new memories. Nothing ever comes easy and everything that is worth having is worth doing. So keep that in mind during the holiday season. It isn’t what you get but what you can give to other people that matters.